EastSouthWestNorth: Are The Anti-Japanese Demonstrations Spontaneous or Stage-Managed? Are The Anti-Japanese Demonstrations Spontaneous or Stage-Managed? This is an interesting question because the evidence contains some contradictions. For the April 9, 2005 demonstration in Beijing, there is the suggestion that the government had a firm hand, including busing the demonstrators back home afterwards. 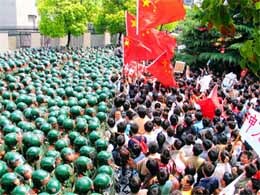 On April 16, 2005, the government decided that there would be no demonstration in Beijing, so it did everything within its power to successfully make sure there wouldn't be one. This is clear evidence that the government could switch on or off at will. All of this would support the theory that the entire sequence of events was stage-managed by the government all the way. But on April 16, 2005, there was a massive demonstration in Shanghai. All the evidence suggested that this was an undirected and therefore disorganized event. The original call to demonstrate was sent through Internet forum posts, email and SMS, there were no marshals on course to give directions and certain individuals engaged in destructive behavior against Japanese-related stores and properties. All of this would support the theory that this demonstration was spontaneously self-organized. How would you reconcile the two theories? There exists a third theory that would make the Beijing and Shanghai events perfectly sensible. This may be characterized as a paranoid theory, but just because you are paranoid does not make the theory false. Read on. Enraged about Japan's tendentious textbooks and territorial disputes in the East China Sea, Sun Wei, a college junior, joined thousands of Chinese in a rare legal protest march on the streets of Beijing last weekend. Yet the police herded protesters into tight groups, let them take turns throwing rocks, then told them they had "vented their anger" long enough and bused them back to campus. "It was partly a real protest and partly a political show," Mr. Sun said in an interview this week. "I felt a little like a puppet." Mr. Sun, the college junior, said he felt that most of those who had taken part, like himself, cared deeply about what he said was Japan's hostility toward China. "There is not a single person at my university who would defend Japan," he said. "It is clear that the Japanese have forgotten their own past." But he said the micromanagement of the protest left him feeling that his own government was "playing tricks." Some analysts say the authorities have managed the protests deftly, though, tolerating and even encouraging discourse that would normally be taboo. "I think the movement has been heavily manipulated," said Yu Jie, a critic of the government who has written extensively on China-Japan relations. "The sentiment against Japan is real, but the government has co-opted it for its own purposes." But in one indication of how the government sought to manage the event, at least four leading organizers of previous grass-roots efforts to confront Japan were ordered to stay home, the four said in separate interviews. One organizer said the authorities had reminded him of that order by cell phone on Saturday. "We were told this was an entirely spontaneous event, so the people leading the movement must have no role," said Tong Zeng, who has been organizing anti-Japan activities since the late 1980's. "The police wanted to maintain tight control." In Ming Pao (via Yahoo! News) (Hong Kong, April 17, 2005), there was a report about the conditions in Beijing on the next weekend, when there were rumors that another demonstration was about to happen. The following is a bullet-point summary of actions taken by the authorities to ensure that there would be no public demonstration in Beijing on this day. And there was none. The authorities have reportedly issued orders to various government departments, party organizations and business enterprises to inform their members not to participate in any marches or even boycott Japanese goods. A number of civic organizers who had been active in the past and took part in the April 9 march were "invited" to go out into a suburban location outside Beijing for a brief "rest" over the weekend. Several dozens of police cars and fire trucks were stationed outside the Japanese embassy in Beijing. Six policemen wearing steel helmets and carrying shields and batons stood guard in front of the building. In front of the official residence of the Japanese ambassador, the police closed the road off. Behind the police guard, there were two police vehicles mounted with steel nettings to prevent people from approaching the building. According to eyewitnesses, some citizens attempting to assemble in front of the building early in the morning were dispersed by the police. In front of the International Club, a bus was parked and contained fully equipped policemen ready to move. Tienanmen Square was flooded with policemen, armed policemen and undercover officers. One tour guide explained to his tourist group: "A special vista of Tienanmen Square is the large number of police personnel." On university campuses in Beijing, there were severe measures in place. At universities such as Beijing University and Tsinghua University, all visitors must show their IDs, and admission is denied to people who are not staff, faculty or student. If students want to go out, they must register their names. At the Heilung building near Beijing University, which had been the point of assembly for marches, the police increased their presence with many police vehicles and officers. There were several empty buses nearby; reportedly, people who refuse to disperse will be arrested and taken away by bus. The Shenzhen authorities had rejected all applications for march permits on April 16. Furthermore, the leaders of many anti-Japanese organizations were invited for discussions and then told in no uncertain terms that a march without permit would be dealt with under the public security laws. This caused the plan for the anti-Japanese march to be aborted. Earlier, some Shenzhen stores displayed anti-Japanese signs, but the police ordered those signs to be removed. Yesterday, about a dozen people showed up to demonstrate. They assembled at the Jusco store, shouted anti-Japanese slogans and waved banners. They were watched closely by a large group of public security officers and undercover policemen. Near Huaxin Road, the police interceded and demanded the group to disband on the grounds that they had no permit to march. Some of the marchers were escorted to a nearby bus stop and forced to get on the next bus. Meanwhile, it was reported that thousands of police officers were deployed at various Japanese stores or companies in Shenzhen. Marchers, many carrying Japanese mobile phones and recording the event with Japanese digital and video cameras, chanted slogans urging a boycott, sang the Chinese national anthem and shouted "join us!'' to onlookers lining the streets. Many carried signs and wore T-shirts advocating the same themes. "If we don't buy their products, they will all starve to death,'' one mother was overheard explaining to her small daughter who had asked her why a boycott made sense. While the authorities urged calm, they did nothing to stop an occasional burning of a Japanese flag, or two rather pathetic incidents of vandalism. An earlier Internet notice on the Shanghai demonstration march was this (via PeaceHall). Please be mindful that the sender of the message is not identified. People: The information is that students from the various universities will participate on their own accord. Presently, the universities have all gone into a state of tension, and all academic conference attendance have been postponed to make sure that the situation does not get out of control. You should not attempt to consult the various forums or BBS's, since all posts related to the activities on that day are being deleted immediately. If you care, you should disseminate this note to people you know and invite them to attend. If you don't want to participate directly, you can come and watch. It will be an extraordinary sight. 3. Don't bring Japanese-manufactured cameras, video cameras, mobile telephones, audio recorders etc, just in case. 4. Bring a market pen to sign your name. 5. When you arrive at the consulate, do not throw rocks or metal objects. We suggest that you bring eggs, tomatoes, images of Koizumi's head, lighters, Japanese flags, etc. 6. Recommended slogans and placards: "Boycott Japanese goods to protest Japan revising its history textbooks!" "Boycott Japanese goods, support Chinese goods" "Oppose Japan as Permanent Member of UN Security Council" "Reject Japanese goods, return our Diaoyutai!" etc. Purpose of Activity: To protest in the loudest, most powerful terms against Japan refusing to admit to its war crimes during the Second World War, revising its history textbooks, occupying the Diaoyutai Islets by force and wanting to become a Permanent Member of the UN Security Council. 1. This event is not directed against any Japanese individual living in China. It is directed against Japanese rightists and their supporters. Therefore, we must not direct any action against our friends here. 2. The police are the people's servants. During the march, they are just as patriotic as we are, but they have the additional duty of guaranteeing safety during the march. We ask everybody to work with the police. Especially in front of the consulate: if the policeman is looking at you, then you should not be throwing stuff; if no one is looking, you can throw an egg or a tomato; if the policeman looks at you after you throw stuff, just smile at him. 3. During the route, there will be Japanese-invested shops and companies. Please do not attack them in a destructive manner. If there are damages, the Japanese will ask the Chinese government for compensation. So please act sensibly. 4. When burning the Japanese flags or the head of Koizumi, please be alert to personal safety and don't burn yourselves. 5. It is key to control the extent of the whole event. So we ask the leaders of various organizations (such as schools, companies and social groups) to pay attention. Shanghai is an international city and the lifeline for the national economy. Please, everybody should participate in this even in a sensible manner!!! 6. The above points are what we thought of, but you may be able to add some more. Please remind your friends who will be participating. Translation: 'According to law, marches must obtain permission. The masses, in expressing their warm patriotic sentiments, must be orderly, rational and law abiding.' They could have pronounced Saturday's proposed march to be illegal with serious consequences for marchers, but they did not. Since they didn't say so and only asked people to be orderly, it can be taken that this march will be allowed. In the anti-Japan protests, people have sent old-fashioned chain letters to friends via e-mail or text message. Typical is a 23-year-old professional in Shanghai who asked to be identified for this article by her English name, Violet. She uses an instant messaging service on her work computer to communicate with 50 people on her "contact list." 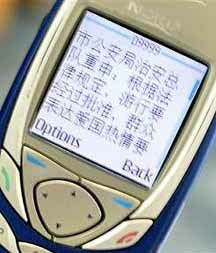 Before the Shanghai march, one person on Violet's contact list sent her links to vote "no" in online polls about Japan joining the United Nations Security Council. Violet voted and then forwarded the links to more than a dozen other people on her list. She also received an instant message to join the Shanghai protest and recruit others. But she said the day before the protest, her cellphone buzzed with the mass message sent by the Shanghai Public Security Bureau. She decided not to march. The next day, though, friends on her contact list sent Internet links to photographs of the protest that were banned in newspapers. Even her boss took a look. "He said, 'O.K., look at the pictures but do not forward this,' " Violet said. "My boss does not want to be involved in political issues." Others in Shanghai learned of the march from an Internet posting that included a suggested route for the march and tips like bringing dry food and not bringing Japanese cameras. Some people wondered if the government had planted it online. [translation] Several tens of thousands people in Shanghai participated in an anti-Japanese march. Although all sides tried to act in a restrained manner, some people still managed to break windows at the Japanese consulate and a number of Japanese restaurants. Some people believe although these incidents were minor, order would have been maintained better if the march had organizers. During the recent anti-Japanese wave across China, there had been no march in Shanghai and this was duly noted by outsiders. Today's march in Shanghai showed that the anti-Japanese wave has reached even the city that has attracted the most amount of Japanese investment. Based upon our understanding, this march in Shanghai was not planned by any organization or individual. Through the Internet email and SMS, people were told to assemble at the People's Park and then proceed towards the Japanese consulate on Wenshan Road. Some marchers felt that due to the absence of the leadership by organizers, the whole march appeared to be improvised, even chaotic. First of all, although the messages asked people to assemble at People's Park at 9am, the marchers departed at 840am since there were no leaders. After that, the marchers became disconnected on the way. The leading group walked very quickly, and often dropped the trailing groups. When the group reached Donghua University on Yenan West Road, the leaders departed from the route and went towards the closed gate. This caused the police to be confused. Under the 'threat' of the young demonstrators, the university opened the gate to calm down the emotions. On the way, a small number of people noticed the chaos in the group and volunteered to act as leaders to remind people to follow the route at the same pace. When the marchers approached the Japanese consulate, they began act like "wild horses without reins" and broke straight through a human wall of about 100 policemen. Without the benefit of organization, they then attempted to break through the line of several hundred armed policemen. They were unable to breach the line to reach the front gate of the Japanese consulate. Instead, some demonstrators went around to the back of the consulate and threw rocks and eggs. Other demonstrators climbed up the buildings outside the consulate and burned Japanese flags. The crowds began to assemble out the Japanese consulate around 12 noon. They had accomplished the goal of the march but they did not disperse for several more hours. More and more demonstrators kept arriving and the atmosphere was tense. [translation] "Chinese traitors! Japanese pleasers! Shameless!" The marchers angrily threw tomatoes, eggs and rocks at one after another Japanese-manufactured car. One humiliated female reasoned with the crowd with tears in her eyes: "There are Japanese cars everywhere on the street! Why humiliate me? I am Chinese too!" Not only did those words fail to win any sympathy, the crowd actually became angrier and spit at this innocent compatriot, flashed obscene signs at her and someone even pushed against her head hard. So she sat there, disheveled and in tears. Fortunately, some sane Chinese citizens said, "Chinese people do not attack other Chinese" and "The Japanese consulate is just ahead. If you want to wreck something, go on down there!" The female driver was then able to roll up the window of her Honda and leave. 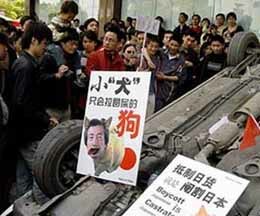 "Boycott Japanese goods" was one of the major slogans of the march, and many Japanese stores were attacked by the crowd. Japanese cars also became targets. A Japanese car parked near the Japanese consulate belonged to a government official. The rowdy crowd jumped up and down on the roof to smash the skylight window. Then they toppled the car upside down, and placed a Chinese national flag on the wreck. The surrounding crowd clapped loudly and shouted: "Down with little Japan!" A large store that specializes in Japanese wine became the target of the crowd. In spite of the pleas of the public security officers in front of the store, the glass windows were smashed and the crowds rushed into the store, snatched the bottles of Japanese wine and smashed them by throwing them against the wall. A Japanese person was observed to board a police car to leave the Japanese consulate area. When the crowds saw that, they surrounded the police car and attempted to topple it. Dozens of police officers rushed over and steadied the car, drawing loud boos from the crowd. The back window of the car was smashed and the body of the car was splashed with black ink, but the car was able to get away. [translation] Ms. Li wore a red top and stood out in the crowd of demonstrators in front of the Japanese consulate. She explained that she was not out here to demonstrate. "I'm only here to watch the scene." But when she saw the crowd throwing stuff at the consulate and throwing cigarette butts and newspapers on the ground, she got very angry. "If the foreign media should report on the quality of these demonstrators, it will be a disgrace to the Chinese people!" In order to "influence" other demonstrators, Ms. Li bent down and began to pick up the garbage piece by piece and place them into her plastic garbage bag. Some of the demonstrators were also affected by her, and helped to pick up the garbage as well while saying: "Let the foreigners know about the quality of Chinese citizens!" Still, there seemed to more rock-throwers than garbage-pickers at the scene. One garbage picker got on a high vantage point and shouted to the crowd: "We are here to oppose Japan, not to destroy our own garden. We will not be looked at by others with contempt!" He asked the people to clap to signify patriotism, with the first demand being not to step on the flower bed outside the consulate. He received the applause of some of the demonstrators. [translation] The demonstrators included people from various provinces, and even from different countries. There was a male from the state of California in the United States. He did not speak Chinese too well, but he parroted the slogans. When people started to throw rocks at the consulate, he did the same. He did exactly the same as the locals. This Ameriacn is an anti-war activist. He said that he is "opposed to any action that can lead to war" and that "Japan is worse than Germany because she does not know how to acknowledge on her own errors." When he found out that there was a demonstration, he came to the consulate and launched criticisms against his own president: "No Bush! No Japan!" At first, he just stood in the crowd and observed. When he saw people throwing rocks at the consulate, he learned by example and picked up rocks to throw and yell: "Down with little Japan! Long live China!" His imperfectly pronounced Chinese caused the bystanders to laugh, and some demonstrators even yelled, "Long live the foreigner!" (老外萬歲﹗). This foreigner seemed to be quite elated and kept yelling at the Deutsche Welle television camera, "Look! China is changing!" [translation] At the march yesterday, a number of people were emotional and some even engaged in destructive behavior against stores. But the calm and restrained people constitute the majority of the marchers. According to this reporter's personal observations, the "hot-headed" elements constitute about 20%, whereas the rest only chanted slogans or marched silently. According to a march organizer who refused to disclose his name, the idea of this march came from a dozen like-minded people. Before the event, the group decided that the definition of the march would be a "spontaneous movement among the people to use peaceful means to awaken the Chinese people and to express our discontent towards the Japanese government." Unfortunately, he said, there were many unexpected fresh faces with uneven quality and their destructive behavior towards Japanese stores were contradictory to the original intent of this march. Dan Washburn's Shanghai Diaries has an eyewitness account. The Chinese Communist Party's expertise is in organizing mass movements. The Chinese Communist Party is not a monolithic block of steel. Rather, there are various factions which are always struggling against each other. Every single mass movement in the history of the Chinese Communist Party was the result of factional fighting. The Anti-Rightist Movement, the One Hundred Flowers Bloom campaign, the Great Leap Forward, the Cultural Revolution, the anti-Lin/anti-Confucius campaign, the 1989 student democracy movement and everything else can be interpreted in that light. A mass movement may have started spontaneously, but it will be instantaneously co-opted for factional fighting or crushed if it suited nobody's purpose. Whenever there is a mass movement, you should look at who is the black hand behind the curtain and what are the motives. Using these axioms, how might we interpret the events in Beijing and Shanghai over the past two weeks? If the whole history of the Chinese Communist Party is about factional fighting, then we should identify the factions of this moment. The two major factions within the Chinese Communist Party right how are the Hu Jintao-Wen Jiabao central government and the Shanghai gang which is centered around former President Jiang Zemin. On April 9, the central government which controls the Beijing area decided to set up an anti-Japanese demonstration for political purposes. It stage-managed the event successfully. Meanwhile, Shanghai refused to lift a finger to organize a similar event whereas Shenzhen did so. On April 16, there were talks of more demonstrations. The central government had achieved its political objectives on April 9 and did not want more demonstrations because things may get out of control. Therefore it did everything within its power to prevent another demonstration in Beijing. Meanwhile, Shanghai did its best to make possible a massive anti-Japanese demonstration without being involved in the actual organization. This was benign negligence. Hangzhou apparently joined Shanghai as well. This was obviously a big slap in the face of the central government. Shanghai could have stopped this event easily if it was fractionally as pro-active as Beijing was. I don't deny that the people can be used by the Chinese Communists. So what? We are being used for the purpose of protecting the national interests. We are not being used to attack someone's political enemies. But it is entirely possible that the people are being used once again to attack someone's political enemies. Are the people in the streets mistaken and being misused once more? Are they unwitting puppets again? As a simple blogger outside of China, I cannot tell you whether this theory is true or not. But you can track future developments and compare this theory against the more simplistic theory based upon the "spontaneous" versus "stage-managed" dichotomy. According to historical form, when the dust settles, one faction will be in control and the other faction will fall into disfavor; and then the hammer will fall on the demonstrators because they are no longer useful and actually pose a threat. An editorial in Apple Daily (Hong Kong) captured the confusion over the conflicting information. [In translation] Over the past three weeks, there were some confounding unusual circumstances about how the demonstrations were handled in various places. It may have to do with how the top authorities in the central government wish to handle the relationship with Japan, or about the economic self-interests of the local governments, or the local social conditions. First of all, the demonstrations have occurred mostly in the coastal cities with very few in the central and western parts of the country: Xian, Nanning, Changsha, Chengdu and Wuhan are the only cities and those demonstrations were small in size (from a thousand down to dozens). One explanation is that the coastal economies are better developed, and the penetration of the Internet is higher. The demonstrations were initiated principally through the Internet and SMS. But this author does not believe this is an adequate explanation. The other explanation has to do with unemployment rate, wealth inequality and social instability which make the local governments become concerned about how large-scale anti-Japanese demonstrations be turned into anti-governments ones, thereby destroying investments and economic development. Thus, high pressure was applied in the central and western cities to stop anti-Japanese demonstrations. The other unusual phenomenon was that demonstrations were occurring in cities where there should not be any, while they are not occurrsing in cities where there should be. Which cities should have demonstratons? Those that suffered the most under the Japanese occupation should come forth and condemn the revision of Japanese history textbooks, such as Shenyang and Qiqihar in the northeast and Nanjing, Taiyuan, Zhengzhou, Qingdao, and others. But apart from Shenyang, there was nothing elsewhere. On the other hand, the traditionally economically motivated Guangdong province has large demonstrations in four cities; Shanghai has the largest amount of Japanese investment had the largest demonstration. In total, only Beijing, Guangdong, Shanghai and Hainan had demonstration had more than 10,000 people in attendance. Why? The author cannot prove this, but these demonstrations must have been "tacitly approved" to reach these sizes. Thus, we can see the directives of the local authorities in making those decisions. Their decisions differed from each other, which means that the central government may not have issued detailed directives to them, or else they are autonomous, or else they are considering their own interests (including investment environment as well as political capital). Alternately, the central government had told them to take different actions; in particular, the cities that are perceived to be most Japan-friendly had the largest numbers of demonstrators in order to communicate to Japan that the citizens' feelings have reached boiling point. Or perhaps there are other reasons?